You may have experienced slowness when trying to synchronize your iPhone to PC using iTunes. 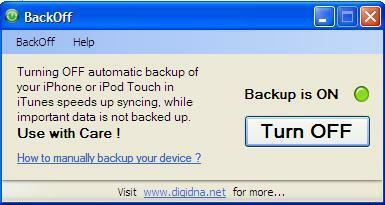 Part of the reason is due to huge portion of the time has been spent to backup iPhone contents into PC. While this automated action could be useful in many cases but it may not necessarily true for certain circumstance. And that is how this tiny utility will able to help. Named as BackOff, it provides an extra button option so that users can simply toggle to turn the backup feature on and off depending on situation and preference. Once install and launch the utility, a very simple interface will appear with a single button allowing users to either turn on or turn off the backup feature. Do take note that the iTunes will need to be closed before the utility can be used or else a message will be prompted to remind users to do so. After iTunes is closed, clicking on ‘Turn Off’ button on BackOff utility will switch the default backup feature of iTunes to OFF mode once after iTunes has been reopened. By now, you should notice that your iPhone will be able to synchronize faster than previous by skipping backup activity and eventually able to shorten your time spent purely on data transfer without doing unnecessarily data backup. Consumed less than 1.3MB of your hard disk space, Backoff is compatible to run with both Windows (XP, Vista and Windows 7) and Mac OS X (Tiger and Snow Leopard) with ability to support iPhone 2G, 3G, 3GS, iPod Touch as well as potential iPad compatibility in short future.